Myth: Orthodontists only treat children and teens. Fact: You’re never too old for orthodontic treatment! Dr. Mary Paula and Dr. Henry Jr. treat patients of all ages. In fact, an American Association of Orthodontists (AAO) survey found that one in five orthodontic patients is an adult and a whopping 92 percent of them would recommend treatment to other adults. With aesthetic options like Invisalign and clear braces, you can achieve a healthy, beautiful smile and no one will even notice you’re straightening your teeth. Myth: Children have to wait until all of their permanent teeth come in for orthodontic treatment. Fact: Children should see an orthodontist by age seven, which is well before all of their permanent teeth have come in. In many cases, we’ll just monitor the development of their teeth and jaws until it’s time for treatment. However, sometimes there are issues that need to be addressed early. With interceptive orthodontics, we start with Phase I braces or appliances while the child still has their baby teeth in order to avoid extractions, surgery or complex treatment when they’re older. 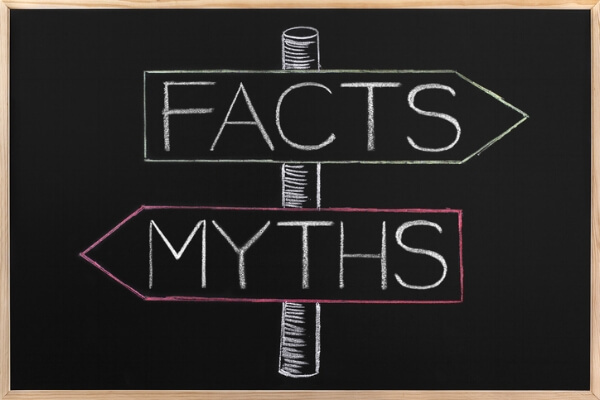 Myth: Orthodontic treatment isn’t worth the cost. Fact: An improved bite and stunning smile not only looks great and boosts your confidence, but also have important health benefits. Teeth that are straight are much easier to effectively brush and floss, which prevents cavities and gum disease. Also, teeth that do not protrude are less susceptible to injury and damage. An aligned bite also makes for easier chewing and speaking and may help prevent headaches and jaw pain. While the lifelong benefits are definitely worth it for most people, we know everyone’s budget is different. Therefore, we at Zaytoun Orthodontics are committed to making treatment affordable and offering a variety of payment options for everyone. Come see why there is a difference between orthodontics and Zaytoun Orthodontics. Call to schedule your free exam & consultation today- 919-782-6911. Next Next post: Is bringing in your young child to see an orthodontist really necessary?